Kash Killian (bass, cello), Mariah Parker (piano, santur). The Ancient Future Indo Latin Groove program features uptempo selections from Ancient Future's broad repertoire along with remarkable compositions by Mariah Parker from Sangria, her debut release on Ancient-Future.Com Records. Some of the material dates from the early history of Ancient Future. In the summer of 1977, Ancient Future leader Matthew Montfort came to San Rafael to study North Indian classical music at the Ali Akbar College of Music, where he met the members of the Diga Rhythm Band (a project of tabla master Zakir Hussain and Mickey Hart of the Grateful Dead), and formed a Indian-Latin fusion band that included many Diga Rhythm Band members and rehearsed at the Grateful Dead studio. They performed a number of concerts mixing Indian and latin rhythms before splitting up into two groups: a Latin band called Sun Orchestra (with a notable lineup featuring among others Zakir Hussain, Latin jazz pianist Carlos Federico, and Matthew Montfort), and the world fusion music group Ancient Future. So in a very real way, this program takes Ancient Future back to its roots as an offshoot of an offshoot of a world music side project of the Grateful Dead. This program has been performed at venues such as Yoshi's Jazz Club in Oakland, Kuumbwa Jazz in Santa Cruz, the Freight and Salvage, and the Sonoma County Harvest Fair. It is available in trio, quartet, quintet, and sextet formats. Sangria by Mariah Parker (Ancient-Future.Com AF 2017). $17.98: Add 1 to Cart. Buy 1 Now. iTunes. >YTmusic. Shown: Paul McCandless (sax), Matthew Montfort (scalloped fretboard guitar), Debopriyo Sarkar (tabla), Brian Rice (timbales), Duru Demetrius (congas), Kash Killian (bass), and Mariah Parker (piano). Shown: Paul McCandless (sax), Matthew Montfort (scalloped fretboard guitar), Brian Rice (timbales), Duru Demetrius (congas), Kash Killian (bass), and Mariah Parker (piano). 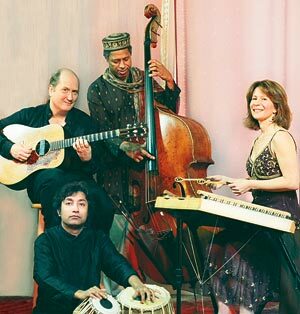 Shown: Matthew Montfort (scalloped fretboard guitar), Ian Dogole (percussion), Kash Killian (cello), and Mariah Parker (piano). Milo's Moment (Parker. 6:06). >YTmusic. This piece features a classic Afro-Cuban style montuno played in a 7/8 meter. From Sangria (Ancient-Future.com AF-2017). Digipak CD- $17.98: Add 1 to Cart. Buy 1 Now. 14 Steps (Matthew Montfort. 4:30). Fourteen beat rhythmic cycle creates a funky Indian groove featuring Zakir Hussain and Matthew Montfort. FREE MP3 (excerpt) (1MB). >YTmusic. From World Without Walls (Sona Gaia/MCA 163) CD- $24.98 (out of print: collectable signed reconditioned copy): Add 1 to Cart. Buy 1 Now. First Flight (Parker. 3:43). iTunes. >YTmusic. "First Flight" takes off with soaring, syncopated melodic lines on soprano sax, guitar and piano, accompanied by a flurry of tabla in a swift 7/8. From Sangria (Ancient-Future.com AF-2017). Digipak CD- $17.98: Add 1 to Cart. Buy 1 Now. Sangria (Parker. 8:17). iTunes. >YTmusic. Inspired by both Indian and flamenco music, a fiery cello solo suggests the plaintive cry of a flamenco vocal, while the tabla solo ends with a tihai, an East indian cadential pattern which repeats three times and ends on the first beat of the rhythmic cycle. From Sangria (Ancient-Future.com AF-2017). Digipak CD- $17.98: Add 1 to Cart. Buy 1 Now. Mezgoof (Ian Dogole. 6:20). FREE MP3 (excerpt) 800K. >YTmusic. Based on Qawwali, a Sufi devotional form of music popular in Pakistan and India. From Asian Fusion (Narada Equinox ND-63023). CD- $24.98 (out of print: collectable signed reconditioned copy): Add 1 to Cart. Buy 1 Now. Matthew Montfort is the leader of Ancient Future, and pioneer of the scalloped fretboard guitar (an instrument combining qualities of the South Indian vina and the steel string guitar). He has recorded with legendary world music figures including tabla maestros Swapan Chaudhuri and Zakir Hussain. He has performed concerts worldwide, including at the Festival Internacional de la Guitarra on the golden coast of Spain near Barcelona and the Mumbai Festival at the Gateway of India in Bombay. Mariah Parker (composer, pianist, and santur player), while completing her degree in music at UC Santa Cruz, worked with ethnomusicologist Fred Lieberman and Mickey Hart on the Planet Drum project. She has performed in the US and Europe, and worked with many musicians including composer Pauline Oliveros, the late Dumisani Maraire (renowned composer from Zimbabwe) and others. She has studied with jazz great Art Lande and Latin jazz pianist extraordinaire Rebeca Mauléon, and performs regularly with Ancient Future. Kash Killion has played extensively with such icons as Cecil Taylor, John Zorn, Sun Ra, Butch Morris and George Lewis. His interest in avant garde jazz was ignited by Sun Ra in 1978, and further heightened by meeting and playing with Pharoah Sanders. Playing cello, bass and assorted Middle Eastern stringed instruments such as, sarangi and esraj, Kash's concert history includes performances with Donald Byrd, George Cables, Billy Higgins, Reggie Workman as well as the Sun Ra Arkestra. Ian Dogole holds a B.A. in Ethnomusicology from Brown University and an M.A. in Classics from Villanova University. He began his musical studies with the piano at the age of five, later switching to jazz guitar which was to be his primary focus until taking up percussion during his ethnomusicology studies. He performs on five Ancient Future albums, and has released many albums under his own name, including Dangerous Ground (Cafe L-737), and Ionospherses (C.E.I. CYK 807-2), all pioneering works in the field of world fusion music. He received a prestigious 1991 Jazz Performance Fellowship from the N.E.A, and 1994 and 1995 Marin Arts Council grants. As a percussionist he has performed in numerous ensembles, including frequent appearances on the East Coast with alto saxophonist Richie Cole. Paul McCandless, during a distinguished career spanning three decades, has brought a soaring lyricism to his playing and composing that has been integral to the ensemble sound of two seminal world music bands, the original Paul Winter Consort and the relentlessly innovative quartet, Oregon. A gifted multi-instrumentalist and composer, McCandless has specialized in an unusually broad palette of both single and double reed instruments that reflect his grounding in both classical and jazz disciplines. Debopriyo Sarkar is a senior disciple of tabla maestro Pandit Anindo Chatterjee. He has been performing in the classical India music scene for many years, accompanying many great artists, as well as an avid experimenter in many forms of music. He has performed in the international arena, playing many concerts in the U.S.A., Japan, India, the Middle East, Canada and Europe, including concert tour with Asha Bhosle and the Kronos Quartet in the U.S. and London in 2005. Anuradha Pal is adisciple of the world renowned Tabla Maestros, Ustad Alla Rakha and Ustad Zakir Hussain, Anuradha has been lauded as the only female professional tabla player in India by the prestigious Limca Book of Records. An A grade artist of the All India Radio, Anuradha has been performing since she was eleven. Besides giving solos, she has been accompanying veterans like Amjad Ali Khan, Hariprasad Chaurasia, Sultan Khan, and Smt. Veena Sahasrabuddhe amongst many others. Indo Latin Jazz: Features compositions from Mariah Parker's debut release, Sangria, and new takes on jazz standards.